That's $50 worth of Neutrogena Products!! Want more info on these products? Parental consent is required for those under 18 years of age. When entering below, click the "Do It!" button and follow the instructions. Then click "Enter!" to confirm the entry. Please make sure you have read and followed all of the Rules and Terms & Conditions. I'm most excited for the Neutrogena Oil-Free Eye Makeup Remover. I'm super exited about trying out the cleanser! I'm a huge fan of most of their products! I'm most excited for the Neutrogena Makeup Remover Cleansing Towelettes. I'm excited to try the Oil Free Eye Makeup remover. I love the towelettes! I am most excited about the makeup wipes. I've heard really good things about them. - I want to create an actual skin care regimen this would def help ! Daily scrub! 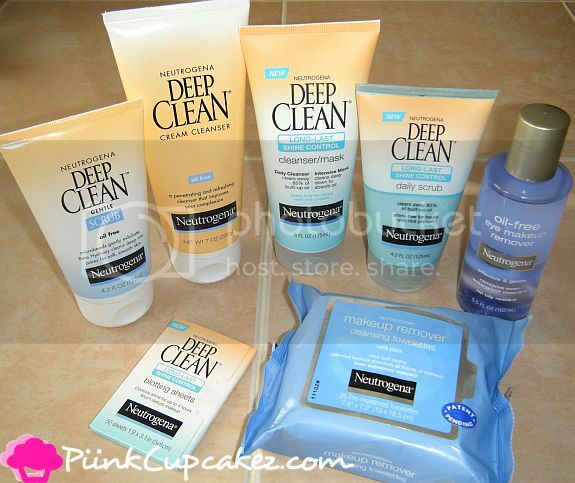 Most excited about Neutrogena Deep Clean Cream Cleanser! I want to try the Neutrogena Oil-Free Eye Makeup Remover.